In the home of an Arts & Crafts dealer, we find prized furnishings, lighting, and tableware, all objects of discernment in an unfussy setting. Because they add color, style notes, and history, small things make the difference. There’s a saying amongst antiques dealers: “You can’t be a collector and a dealer.” Well, bartenders probably shouldn’t drink, but some dealers can, and do, collect. The owner of this house, a noted Arts & Crafts antiques dealer, says the solution is accepting that the décor at home is not static. Pieces move in and out. Mr. DeFalco and his wife had a collection assembled over several decades. It was a case of finding a home for their furniture, not finding a home and then furnishing it over time. 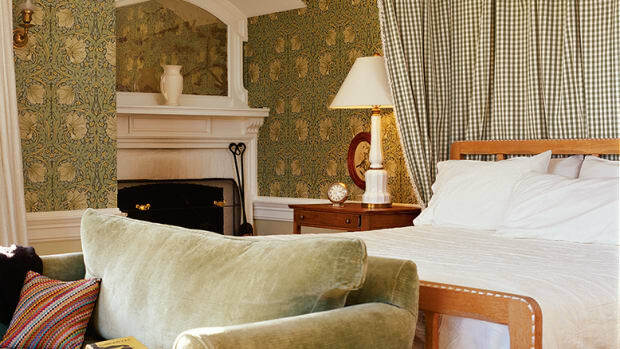 Some years ago, when the couple were house-hunting, they looked until they found the perfect dwelling: an 1860s carriage house of rough stone in Connecticut. The building had already been converted to a residence, but needed a complete remodeling nevertheless. 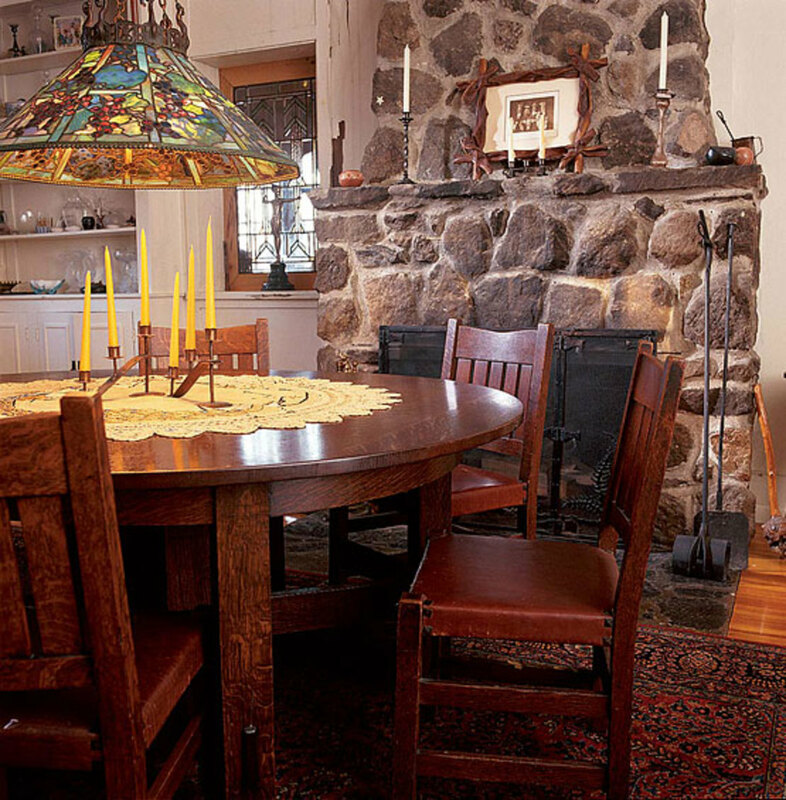 A Gustav Stickley dining table and 16 matching chairs are lit by a Tiffany fixture. 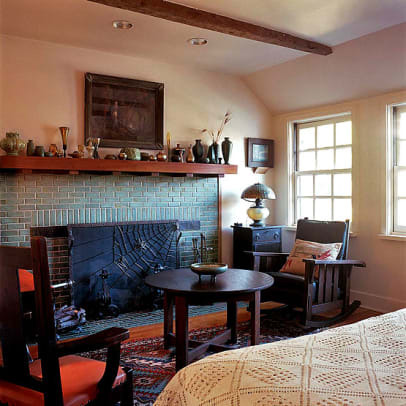 As in Stickley’s own home, the furnishings and architectural materials such as the stone fireplace are the décor; there is no applied decoration. This home differs from the interpretive, revival interiors that have become typical in recent years. 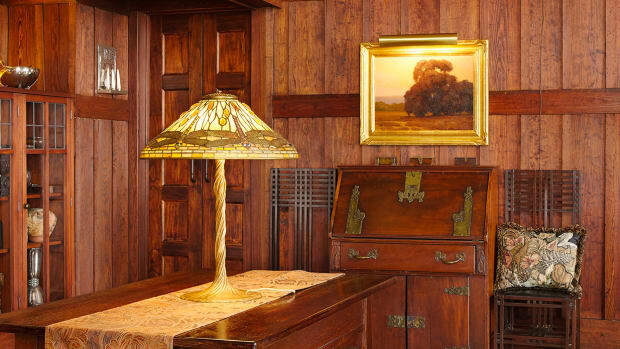 Here, the collection is the décor; the owners decided to forego ornamental wall treatments to keep the focus on their “hall of fame” of American Arts & Crafts pieces. Over time, each object was selected with knowledge and discernment. Despite this dealer’s passion for the Craftsman style, his house looks like neither a booth at an antiques show nor a museum installation. Credit the personal touches throughout. A silver tea service, handed down through the family, lends grace and polish to a Stickley oak sideboard. 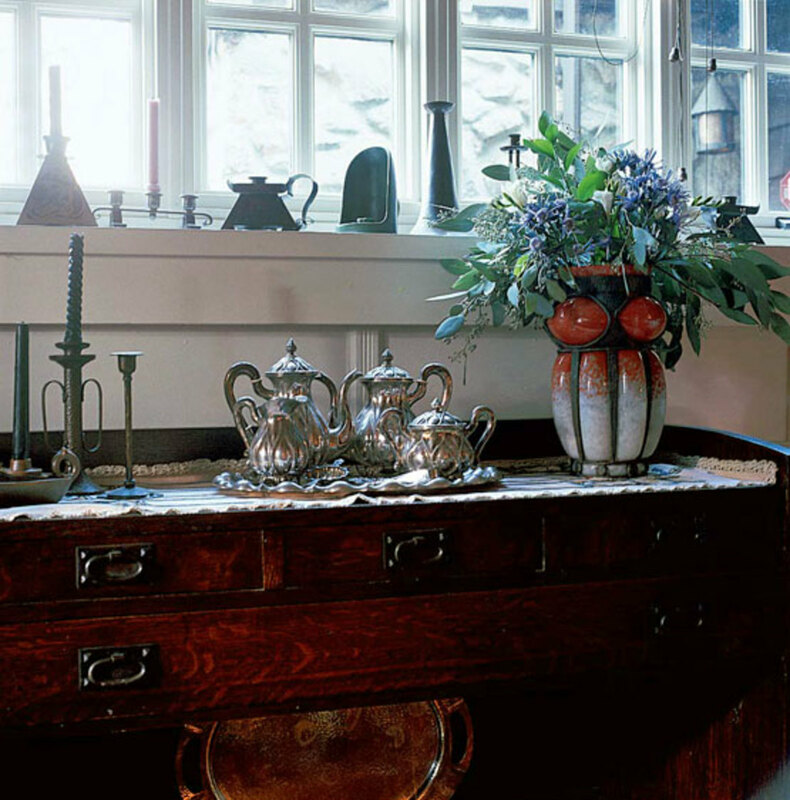 Part of the collection of single candlesticks sits on the sill; the silver service is a family heirloom. Then there’s the collection of unmatched candlesticks. This is a warm and inviting interior that avoids the stiffness incumbent on so many houses “done” in a single period. Yet each piece invites (and deserves) appreciation. 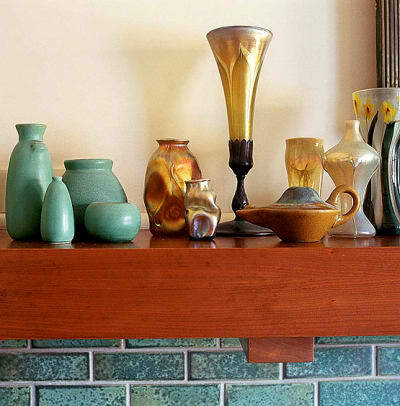 As scholarship has grown and the revival has embraced many diverse roots, we better recognize sub-styles in work that emerged during the first and second decades of the 20th century in Arts & Crafts lighting. 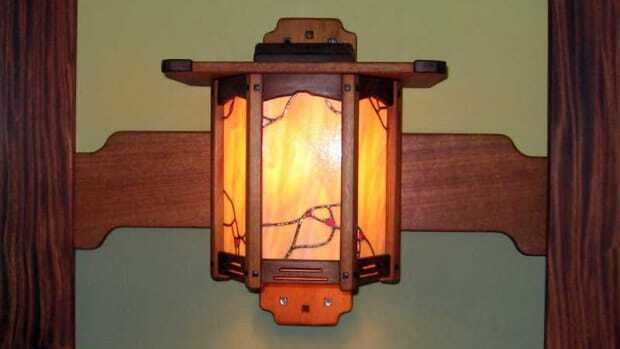 Bungalows, Tudors, and Foursquares date to the electric era, after all, so lighting is integral to the Arts & Crafts interior. Craftsman lighting adds immeasurably to the mood.